One of several paintings haunting me. I’m holding myself to higher standards lately, hanging onto nearly finished pieces, putting them aside for weeks, seeing them anew and correcting. Only after many improvements, am I letting them go. The eyes and your face expressly gripping and the shadow in the back is awesome! Hi Marion! It’s getting better, thanks so much:) Moving, a full time job. Wishing you all the best in your new home. Thanks for visiting! How I admire the expressive quality.Look at those eyes,the shadow of the eyelid!Amazing.The sharp piercing look builds a hidden conversation with the viewer.Immediately draws attention,arises questions,so hard to fathom out the mystery.Great art Elena! I love to hear of you digging in..this is so worth it – how haunting and compelling she is..so many ways to read her. I love how the black is not all so black too, something is living and breathing in here for sure.. Thank you, Cath. “Digging in” is exactly what I’m doing. Great phrase! Elena, I am speechless! This one will stay with me for a while is all I can say. Definitely haunting and powerful. I understand the desire to hold yourself to a higher standard, though I’m not sure I’d be able tell if something of yours failed to meet any high standard. They are always terrific, but I do the same with my writing (not that you’d be able to tell with my current goofy post – some fine art on display). I think the older and more experienced we get, having struggled with whatever our chosen media is, the more we realize that the quality we seek only comes with intense patience. Not surprising, well said, James! Age and experience teach us so much. It’s too bad that our eyes and hands are not able to produce what they could have if we knew this twenty years ago:) Thanks so much. I’m always amazed at how someone can be a great writer or artist at a young age. Experience and building up those mental muscles are such a crucial part of the process. It’s a big mystery. Past lives maybe 🙂 I’ll be a much better writer in my next incarnation (if environmental issues haven’t wiped out the human race). Black velvet richness and mystery. An ivory face emerging from the shadows – there is no single shade of the black; it has much depth and distance. The mystery seems to go on forever. An art teacher of mine once said that before you finish a piece, hold it in front of the mirror. I’ve found more than once that the picture you see tells you a different story. VEry wise, Aubrey. I use the mirror, turning the painting upside down, taking photos of it, to change perception while working on every painting. Thanks so much. Very striking! Your work is the best, thank you! Wonderful – such a fabulous series, full of mystery and emotion. Well ok, but I don’t see how your standards can be any higher! But of course as the artist you know what you are looking for. Haunting is just the right word for this. Haunting and compelling. You are a gracious lady my friend, thank you so much Elena and for the incredible visits you paid my blog today. Your words of encouragement and support stay right with me – it inspires me to keep on, keeping on. Hope you are continuing to mend – your work is incredibly brilliant in execution, can’t wait to see the other pieces. I absolutely love this, Elena, it’s magical and breathtaking. You have a good strategy to let the work wait a bit before finishing, and come back several times to make improvements and corrections, I like that attitude. absolutely beautiful! can’t wait to see the rest! Work’in on them:) Thank you! Wonderful, Elena. Love the weight you’ve brought to the image. Interesting that you are working slower. Thank you, Richard. Yes, after years of experimenting, I’m focussing a bit more. Jeez, Louise! Thank you, Marie! Good to see you and this fab piece, Elena. I like the way the face comes out from the darkness. This is beautiful and strong!!! I like the way you painted the face coming out of the darkness. It is a beautiful image. Hauntingly beautiful indeed…. Is she in mourning? Your talent knows no bounds Elena..
Hello, John. How are you! I appreciate your supportive comments. I’ve just placed your book in my Amazon cart. A gift for someone who will devour its contents. Also a gift for me, supporting our creature cousins. Very effective indeed – well titled – and the face occupies less than one eighth of the canvas! I hope you’re restored to good health. You are the queen of chiaroscuro and the 3 R’s; Review, Reflect, Revisit. Practice makes perfect. Well done. So lovely of you to say, Gloria. Thank you! A stunning painting Elena! it’s difficult to see how you can possibly be holding yourself to a higher standard given the exceptionally high standard you always work to! So very much to learn and so little time. Thank you, Adrian! This is beautiful. 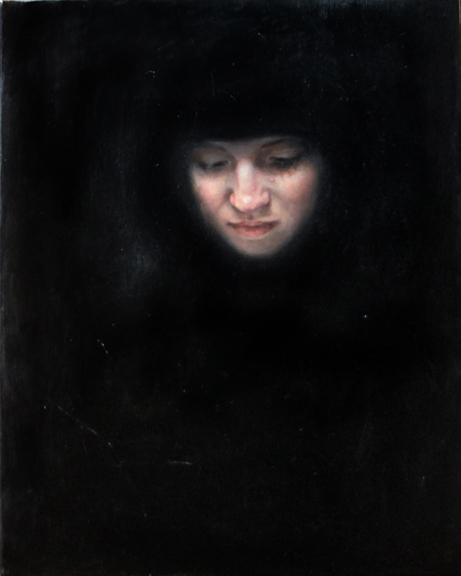 The evocative face emerging from the darkness is extremely effective and powerful. Thanks so very much, Laura. Wow! Your talent never ceases to amaze me. Truly a stunning piece. I like the contrast between the black and the light on her face. In my eyes, what haunting is the delusion this woman got inside of her. Your blush captured it almost unconsciously. Glad you think so . Thank you, Yoshi. Beautiful, beautiful use of black! I love how the light falls on her face. That’s my biggest bugaboo… holding myself back to reflect. I know. Not easy right away, to hold back. I don’t hold back well and have found myself in a deep hole more often than I want. You would think at 61, I would have learned more patience. Aptly named. You capture emotion so well!